Now Refn has entered headfirst into the horror genre with his latest movie, “The Neon Demon” (in theatres Friday), which stars Elle Fanning as a 16-year-old beauty who travels to Los Angeles to become a model and must confront the evils of the city, from a manipulative makeup artist (Jena Malone) and her catty model friends to a sadistic motel manager (Keanu Reeves). 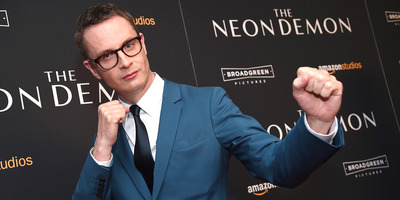 Business Insider spoke to Refn about how his wife motivated him to make the movie, why he decided to go with Amazon Studios to release it (the movie will be available on Amazon Prime after its theatrical release), and the superhero he wants to bring to the big screen. Business Insider: This is being touted as your first horror movie. I’ve always felt you’ve had elements of horror in your movies. Did you plan this out as a horror movie? Nicolas Winding Refn: My initial idea was I wanted to make it a horror film, very much. At times I do enter that world. BI: But this time you wanted to immerse yourself fully into it? Refn: Well, I think the idea was to make a horror film that became a science-fiction film with a lot of melodramatic tropes. BI: At the end you dedicate the movie to your wife Liv. How much has your relationship and collaboration strengthened since shooting in Bangkok with her for “Only God Forgives”? Refn: She’s very much part of my life in that she’s everything in my life and we found a way to use each other much more on a creative level as well. She was kind of the idea for this movie so I wanted to acknowledge that. She gave me the original idea to make the film. BI: Did you see Liv in a different light after she filmed you while making “Only God Forgives”? Refn: Well, you realised what she had to go through. [Laughs] It was a way for us to solidify that our relationship is forever. BI: Was she one of the first people to see “The Neon Demon” when you finished it and needed feedback? Refn: I think she was the first to see the film, actually. BI: Were you pleased by how she interpreted it? BI: My favourite parts are the ones with Keanu Reeves. How did he get involved with the movie? Refn: It was during the casting process. 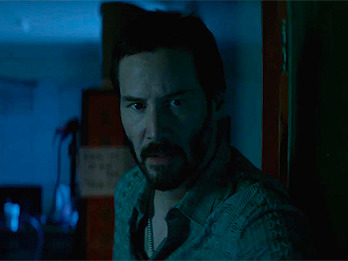 I was tying to figure out who would have an interesting angle on the motel manager and I had written him in various ways, but once we started talking about Keanu with the casting directors, it suddenly all made sense. And I had met Keanu a few times years ago so it was a great way to reach out to him with an actual job offer. He very kindly agreed to be part of it and it was an amazing experience. BI: Do you think about actors for characters in the writing process? Refn: I try not to have too specific notions because it messes up the process later on. I leave it very open to interpretation until I start casting. Everything changes a lot when you start casting. I mean everything. BI: So did Keanu bring stuff to the character that you never imagined for it? Refn: He’s a very imaginative actor. He can have this wonderful balance of humour and fear. He’s got these skills to be entertaining but also quite terrifying. BI: Did you work any differently with composer Cliff Martinez on the score for this one, compared to your other collaborations on “Drive” and “Only God Forgives”? Refn: No, it was a very comfortable and personal relationship. It’s our third movie and the music has never been as important as for this movie. BI: Was he arranging music before postproduction? Refn: We would talk about what kind of music would be in it. Even in the script stage. But it wasn’t until the film was in the editorial process, in the early stages, that he started seeing the film and putting music to it. BI: How big was it for you that Amazon came along and said they wanted to release the film theatrically before putting it on Amazon Prime? Refn: It was huge. I think that Amazon came in with this wonderful opportunity and I had never had that kind of opportunity. Bob Berney is there, who I’ve done “Drive” with, he’s running distribution at Amazon, and there was a very strong commitment to a theatrical experience followed by streaming. Now I know they aren’t the only ones doing that, but I feel Amazon is really bringing films into the future. So for me it was the best of both worlds. BI: Do you think in the future, the best situation for your movie will not include a theatrical release? Refn: No. There will always be a theatrical experience because there will always be cinemas no matter what. It’s like there will always be theatres to have stage plays in. BI: Another thing that’s different about this movie for you is the female-centric cast. Did that happen organically or did you feel you were becoming a “guy’s guy” filmmaker and needed to show something different? Refn: [Laughs] A “guy’s guy” filmmaker. Refn: I just think it was time to do a film about women. But not just women, I wanted to do a movie about a teenage girl. 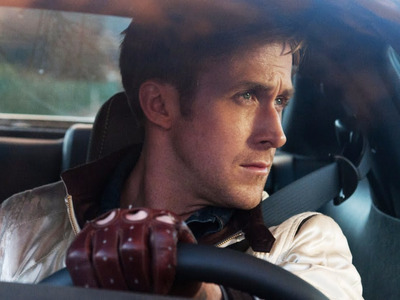 It was a great counter to the masculinity of “Drive.” In “Drive,” there’s a heightened male edge. In “Only God Forgives,” it was almost crawling back into the womb of the mother. And now with “The Neon Demon,” being reborn as a 16-year-old girl. BI: Because of changing to a female point of view, did you find yourself working on a different kind of storytelling than you had in the past? Refn: Not really. It’s very simple, I just close my eyes and I fantasize what I would like to see. I just close my eyes and I fantasize what I would like to see. BI: And for this one, I guess it was a lot of blood, beautiful girls, and a fever dream of LA. BI: In the past, you were vocal about wanting to do a Wonder Woman movie, so I’m curious if you’ve seen “Batman v Superman” yet and Gal Gadot’s Wonder Woman? Refn: I have not seen “Batman v Superman,” unfortunately. BI: Just been too busy? Refn: Yeah, it hasn’t been on the plane, as I’ve been flying a lot. BI: Well, you’ll have to wait it out for the R-rated version. Refn: Oh, there’s going to be an R-rated version? Groovy, I’ll try to catch that. BI: Is making a superhero movie still of interest to you? Refn: I love watching the superhero movies and I would love to make one. But in a way “Drive” is probably the greatest superhero movie ever made. In a way “Drive” is probably the greatest superhero movie ever made. BI: And with “Drive” you had little interference. Could you do that in the studio system, where you’d lose some of that freedom? Refn: God, I would love to make one. It would probably be great fun. I just don’t know when it’s going to happen. I very much enjoy my freedom creatively but I also would love to make one of those big Hollywood films that costs a lot of money and has a lot of people running around with cell phones and all that insanity. BI: Well, seeing that Wonder Woman has already been taken, is there another character that you would drop everything for? Refn: What ones are left? [Pause] You know the one I want to do? I want to make Batgirl. BI: Oh, I’m game for that. Refn: Let’s get Warner working on it.